With a Big Trouble in Little China sequel on the way, and the surprising success of last year's Halloween, it would seem John Carpenter movies are back in fashion. So it was only a matter of time before there was news on one of his most beloved films, Escape from New York, and now that time is here. THR reports that Leigh Whannell, a co-creator of the Saw and Insidious franchises, as well as the director of Netflix's kooky sci-fi flick Upgrade (It's a better Venom, trust me you should watch it) has been set to write a reboot of Escape from New York. While that's it for now, Whannell could ultimately end up directing it, as well. 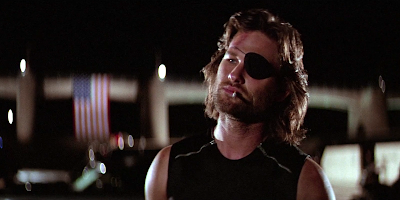 The original 1981 film starred Carpenter's muse, Kurt Russell, as Snake Plissken, who is hired to rescue the POTUS from a future version of Manhattan that has been turned into a war zone and de facto prison. It became a cult classic and inspired a ton of copycats, but also spawned a less-successful sequel, Escape from Los Angeles. There have been numerous attempts to reboot Escape from New York, with the most recent having Robert Rodriguez attached as director. Charlie Hunnam's name was floated to play Snake Plissken in an earlier version. I wouldn't be surprised to see Hunnam's name re-emerge, but something tells me Whannell could reach out to his Upgrade star, Logan Marshall-Green, or perhaps someone like Dan Stevens.